Your Morning Cup: Charissa visits! What is it about late nights that makes me prone to write? Leftover vestiges from my college days? I sit down in the middle of the afternoon with a cup of tea and stare blankly at a word document…I try to force myself to write and what comes out is mundane and banal. Yet at night—say 1:22 in the morning as it is now—words flow through me like tears from a teenage girl. I sit here swathed in my husband’s large warm shirt trying to type softly as he’s lying here snuggled up to my side making an occasional happy grunting noise when I rest my hand on his head. Well, you can’t fight the urge when it hits so here it is ladies and gents, your morning cup for November 13th. Last Friday night we welcomed the first guest to our new home—my best friend/roommate from college and one of my bridesmaids Charissa. She got here on Friday night, and we all settled in to a few great episodes of Seinfeld before hitting the hay. The next morning we woke up and drank our coffee on the patio as the sky cleared up in what looked to be a very stormy afternoon. We spent the day watching one of our Meg Ryan classics, walking all over Queen Anne, exploring boutiques and stores and of course, drinking coffee. We started up the hill and stopped in every little store that interested us—many of them leaving me mumbling, “I’ve gotta take my mom or Ammah or Beth here…” as we wandered in vintage jewelry, adorable boutiques, and cutesy cafés. We explored pasta shops, peered in the window of a restaurant interestingly named “How to Cook a Wolf,” and stopped in an old fashioned game shop that made our heads spin. We finally made our way to El Diablo, the same Cuban café where we got lunch and coffee and chatted beneath the brightly painted murals. A tour of Queen Anne Books and continued on our way. We ducked into a shop filled with beautifully carved furniture and Indian shawls and pillows and a GIANT Bernese mountain dog lying on the floor. We were instantly suckered in by his soulful eyes then he got us to rub his belly and we were in love. After we tore ourselves away from him, we continued walking towards the southern edge of the hill. 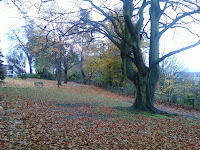 The leaves are falling by the bushel and carpeting the streets and sidewalks in yellow and red. 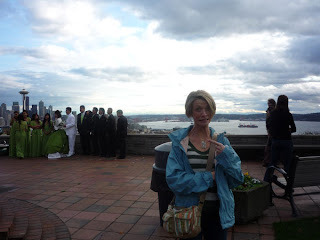 We made our way to Kerry Park for the quintessential Seattle view, when we were suddenly distracted by a party of people dressed in an absurd amount of green. “Is it a prom?” Charissa asked as we looked at the number of green dresses and tuxedos. I then spied what had to be the most awful wedding dress I’ve ever laid eyes on. “NO…it’s a wedding,” I shuddered in horror. 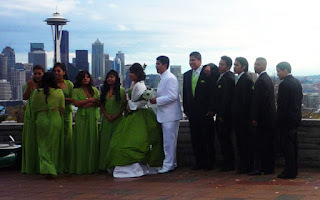 The bride’s dress was mostly GREEN. As if this wasn’t bad enough, it was a white strapless bodice with green boning and green ruching around the bust and green lacing up the back. To finish this work of art were gloves…if they can be called that…that look like something from medieval times. Large poufs just above the elbows led to a fitted arm that expanded to white bell sleeves. And she looked about 15. Contrasting her medieval throwback gown were her bridesmaids lime green dresses which would have better fitted a prom setting than a wedding. Call us awful but we just had to get a picture. By the way, Matthew just woke himself up snoring and looked at me accusingly—haha! The rest of the day we spent curled up and warm at home watching movies, talking, cooking, and enjoying the fact that we only lived 4 hours apart now. The next day Matt was off and we took our first bus ride into downtown Seattle. After doling out the appropriate quarters we boarded the bus and listened to our energetic driver narrate the streets like a baseball radio announcer. We got off at Pike Place Market and showed Charissa around. I got my Market Spice tea which I first tasted after my mom brought it back from her trip with Charlene, and we spent a long leisurely afternoon walking in all sorts of shops and stores. After another bowl of that amazing clam chowder, we headed home. sleep in, take extra long walks, and wait impatiently by the phone to hear back from Delta Marine and see if they’re going to hire me or not. Yesterday I walked nearly 4 miles all over Queen Anne, found a new café where I stopped to read Jane Eyre (so what if it’s my 6th or 7th time? 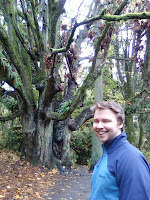 ), wandered upon a new park with some awesome trees, and managed to make it home just before the heavy rain started. Today Matt and I meant to get up and go to the Pike Place Market to pick up a bag of books Charissa left, but someone kept mumbling, “Mmm…snugglebumpkins…so nice…so stormy outside…nice and warm right here…” and kept convincing me to hit the snooze. But hey, can I really complain about a husband who wants to stay in bed late and snuggle with me? I don’t think so! 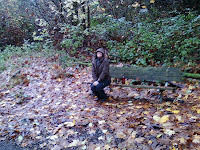 We did manage to make it to a new park located in Magnolia, called Discovery Park. 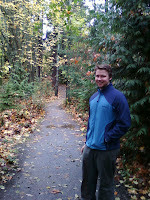 This is one of the biggest parks in Seattle, and we donned our raingear and headed out. Though we only got 45 minutes there, it was easily one of our favorite places we’ve visited so far! Winding on trails through moss covered trees you feel as if you’ve been transported deep into the woods somewhere. It was raining just light enough to make the trees drip, and we decided rather quickly we’d soon be back. back from Delta or anyone else I’ve sent a cover letter and resume to for that matter—keep me in your prayers!